Puree the bananas, vanilla, egg, egg whites, and milk. Preheat the griddle. If using an electric skillet, preheat to 375 degrees F.
Place the bread in an oblong pan and pour the batter over it. Turn the slices of bread so the batter is absorbed evenly. Soak the bread until soft and almost falling apart. You can do this step in two batches. A nonstick pan does not have to be greased; otherwise, use a nonstick spray. Using a spatula, slip the bread into the skillet and cook until lightly browned on one side. Turn and cook until done. Dust with cinnamon. 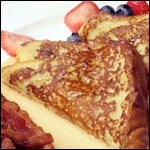 Fairly low-fat as far as French toast goes. 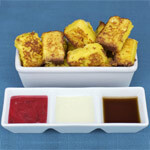 Pureed banana mixed with a traditional French Toast custard gives this French toast a very distinct flavor. 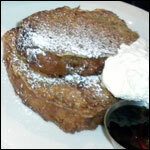 What do you think of Banana French Toast? I used 3 extra large eggs and just one (quite large) super ripe banana. This is one of my new favorite breakfasts. I like that you don't need to add sugar. The banana made it plenty sweet. Oh... I also reduced the milk to 2/3 cup after I read that a couple people found it to be too soggy. 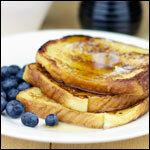 We made this for breakfast and really enjoyed the flavor that the banana gave to the French toast. I felt like it needed to be cooked longer than normal to cook it all the way through the bread. We used a loaf of homemade white bread, so we had nice 3/4 inch slices to dip. A great way to use old bananas. I also used some good ole corn flakes on this one and it was GREAT!! It turned out good for me, with the following changes: I added 1 Tablespoons of sugar with the milk and bananas. I dipped the bread in a bowl of the custard instead of over-soaking it. It had a nice flavor. The French toast came out completely mushy, I followed this recipe exactly. Not only was it too soft it needed some sugar. For future cooks add a bit of brown sugar and don't let the bread soak as long! Honestly surprised that so many rates this one so high. I followed this recipe exactly and the french toast was completely mushy, not anything like good french toast that has some crispness to the outside. Now, I can enjoy french toast too. I cannot eat eggs and this recipe is easy and tasty!!!! A very good way to use bananas in breakfast:). This was such an easy way to use bananas! I have to say I was bored with french toast until this!!! It is so good! It's good... and a way to use old bananas that r too soft to eat. This is the greatest. I put them on a rack in baking sheet and bake at 350 for 15 minutes after done cooking in skillet. 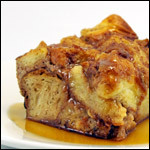 Just great with good honey or syrup. Try dusting with almond powder before cooking in the skillet... makes the outside crunchy! Topped it with some powdered sugar! Yum! A little soggy though! It was a super yummy and simple recipe. I added a little cinnamon and brown sugar to the batter which made it even tastier. I also used mixed the rest of the batter with yogurt and heated it up to make a great sauce to put on top! Great meal with honey and some added bananas! I recomend this for any breakfast! And they are SUPER EASY! It's a really a nice recipe. But I believe that it would taste much better if we added little bit of honey or sugar in the batter. I added some chopped walnuts to the top and covered it with coconut syrup. Excellent! !